The following review was originally published in the October 2016 issue of The Spectrum Monitor magazine. Anyone who knows me knows that since I was licensed nearly twenty years ago, I’ve been a fan of low-power (QRP) operations. There’s just something inexplicably fun in being able to talk to the other side of the world using very low wattage. In a sense, I’ve always felt that, in the world of ham radio, QRP is truly the province of the magician. It’s for this reason that I’ve owned, operated, reviewed, and beta-tested a number of QRP transceivers over the years. What I look for in a QRP transceiver is quite different than what I’d look for in, say, a base station or mobile transceiver. The glory of QRP gear is that it’s more portable than its “full gallon” cousins in the transceiver world, allowing for radio communications on the go. QRP rigs tend to be more compact, lighter in weight, easier on batteries, less expensive, and provide built-in features to support field operation–even winter glove operation. 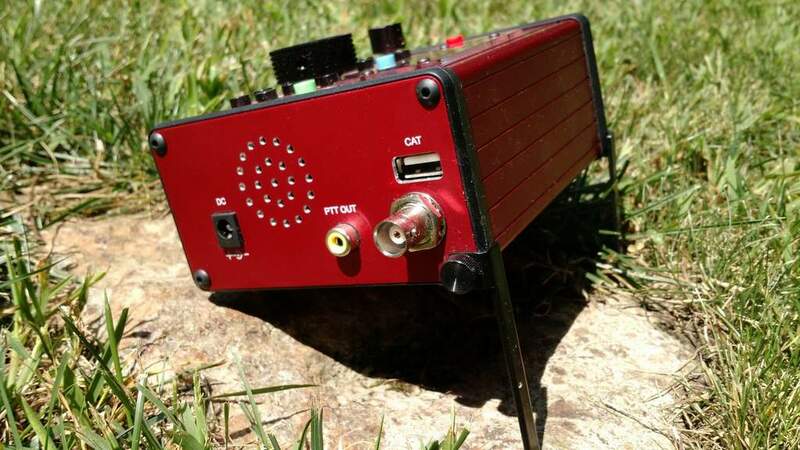 Of course, however, there’s typically compromise in smaller packages; neither would I expect a modest QRP transceiver to perform like a full-size base station. But I do expect it to perform well enough to satisfy my needs in the field or the shack. LnR Precision, Inc., is a North Carolina-based company that specializes in antennas, straight-keys, and last but not least, QRP transceivers. The company has produced a number of innovative QRP transceivers over the years, and for many of these years, I’ve been admiring these from afar. 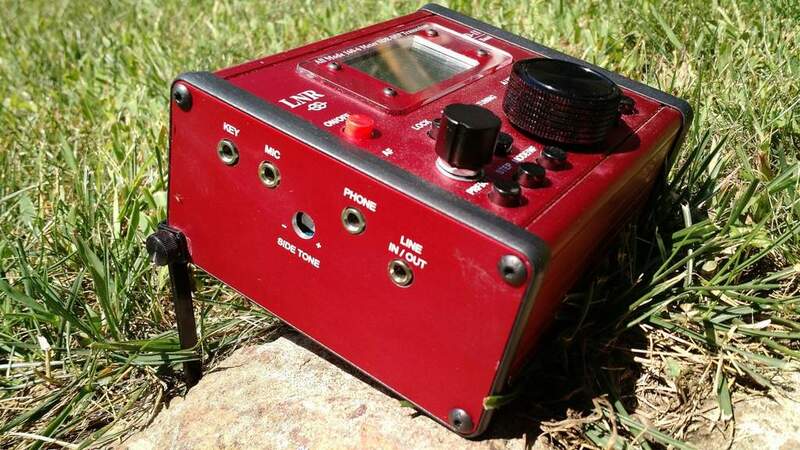 But earlier this year when the company announced their latest QRP transceiver, the LD-11, I was especially intrigued. What really caught my attention this time is that this little transceiver is based on the architecture of their popular LD-5–a five-band, stand-alone direct conversion transceiver. Yet the LD-11 is actually an upgrade on that model, in that it supports 160-10 meter operation with all modes (SSB, CW, CW-R, Digi, AM and FM). Curiosity got the best of me: I had to see this for myself. I contacted LnR Precision, who kindly loaned me a transceiver for review. The left side sports the key and mic ports, headphone jack, a line in/out jack and a side tone adjustment. The first thing that catches your eye is the unusual color of the LD-11: it is red. Very red. Though opinions will surely vary, I rather dig the hot-rod red aluminum chassis of this little rig. The red faceplate makes the buttons quite visible as well as giving the radio a unique and vivid appearance. The backlit LCD display, meanwhile, is crisp and easy to read. It’s large enough that all of the pertinent information (frequency, voltage, mode, filter selection, and tuning step) can be displayed at once. When in transmit, there’s a meter below the frequency that displays either a bar scale or numbers for SWR or Power; when in receive mode, it displays the “S” meter. The LD-11’s buttons have a tactile, responsive, and smooth action. The tuning knob, while lacking a finger dimple, rotates easily with an appropriate amount of brake. You’ll find the DC port, PTT out, CAT port and Antenna input on the right side of the LD-11. LD-11 operation is really very simple. I was probably on the air for hours before I ever needed to reference the owner’s manual for functions. LnR has done a great job giving the LD-11 a logical menu layout and intuitive front panel functions. 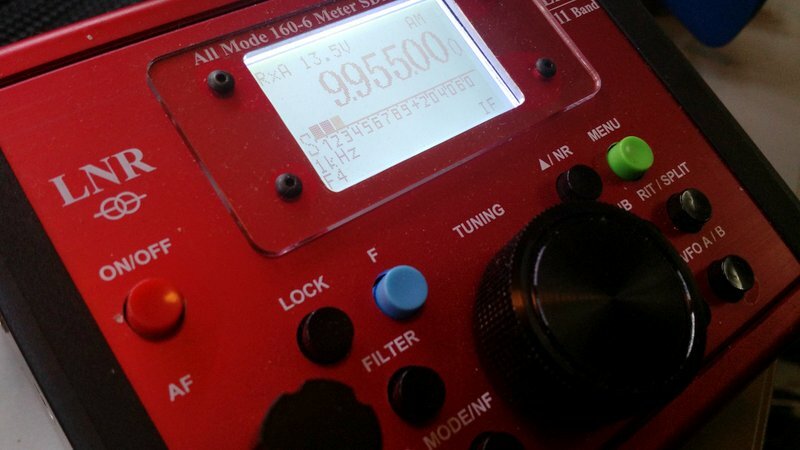 The menu functions give you control of still more settings, such as AGC settings, CW configuration, mic/voice transmit configuration, notch filter settings, NB/NR settings, meter display, transmit power, backlight settings, squelch, digital gain, and AM/FM mode enable/disable, among others. So this little transceiver is feature-rich. Moreover, most menu items can be changed while you’re transmitting. While on the air, for example, I regularly toggle the transmit meter display between power out and SWR while calling CQ. Very handy. Again, operation is straightforward and simple, especially good because at time of publishing this review, the LD-11 owner’s manual is still quite basic (click here to download PDF version). 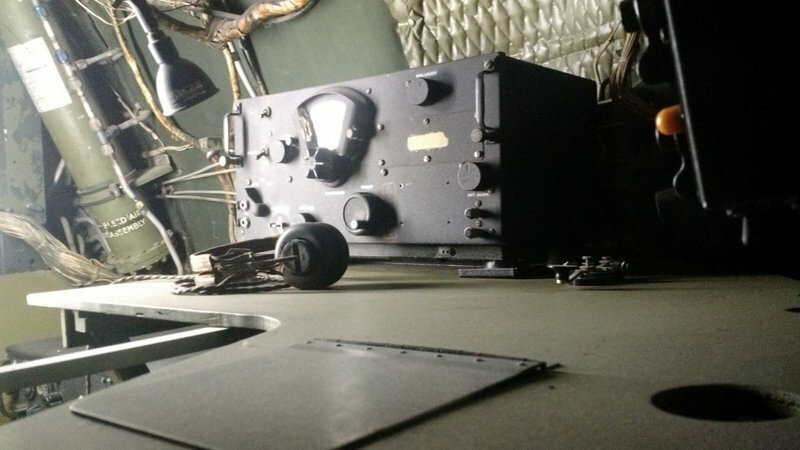 Unlike most of my review radios, which spend a great deal of time in the shack during the evaluation period, the LD-11 spent most of its time in the field–in several US states, as well as in a couple of Canadian provinces. I even used the LD-11 for two weeks in an off-grid cabin on Prince Edward Island, Canada. The LD-11, QRP Ranger, and Z-11 auto-tuner at the Hopewell Culture Park NPOTA activation. My first outing with the LD-11 was at Hopewell Culture National Historical Park in Ohio. Buddy Eric (WD8RIF), his son Miles (KD8KNC), and I made four National Parks On The Air (NPOTA) activations en route to the 2016 Dayton Hamvention. We had a tight schedule for our NPOTA activations, so I couldn’t spend a great deal of time setting up my equipment. So on that day, I paired the LD-11 with Eric’s Z-11 auto tuner and a homebrew 40-meter doublet suspended from a tree. I powered the LD-11 with my Hardened Power Systems QRP Ranger battery pack. And this combo worked brilliantly. At Hopewell, for example, I made twelve contacts, in short order, running SSB with just 8-10 watts output, and received positive audio reports. Also that day, I discovered how exceptionally easy it is to operate the LD-11 in the field. When packing in, I appreciated how lightweight and compact it is, and that fire-engine red chassis meant there was no way I’d overlook it or forget it on the ground. 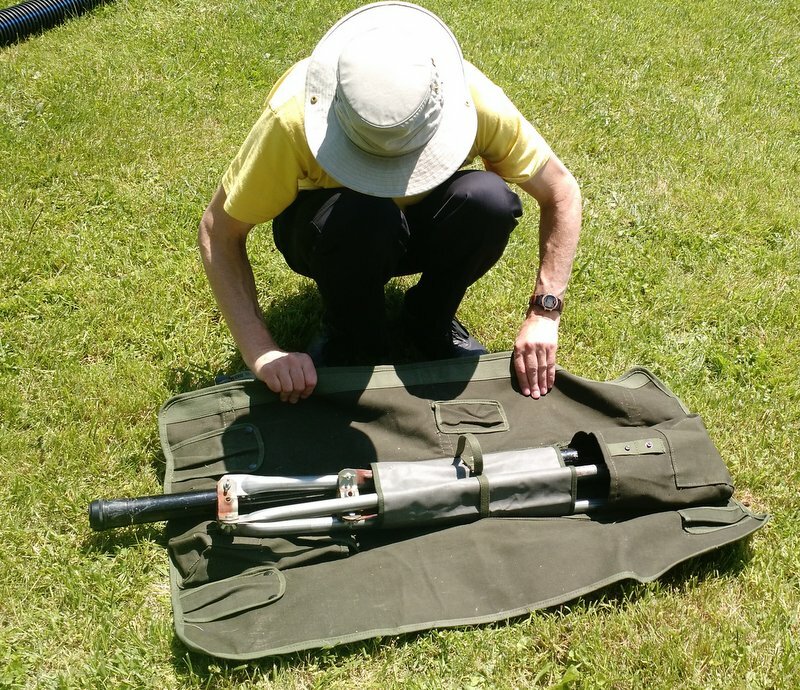 The LD-11 has two fold-down feet to support it on the shack table or in the field. Two missing features, however, might make the LD-11 even more portable: these are an internal battery pack and an internal ATU. Unfortunately, there are no options for these at present (LnR, take note). The LD-11 feet fold neatly under the chassis. The external ATU, meanwhile, adds several extra items to manage: the ATU unit, the power cord, and an extra patch cable. Sure, if you’re operating all day from one location, none of that really matters. But when you’re doing quick deployments, every bit of kit that doesn’t require packing and unpacking also saves time and potential frustration. But I cheerfully used the above combo the rest of the day, logging even more contacts. At the Dayton Hamvention, I decided that one way to avoid taking an ATU to the field was to use a multi-band resonant portable antenna. I was quite busy at the Hamvention and didn’t want to spend time building one, so I decided to take the quick route and simply buy one. I visited a few vendors in Hara Arena and was impressed with the selection of field-portable antennas available. 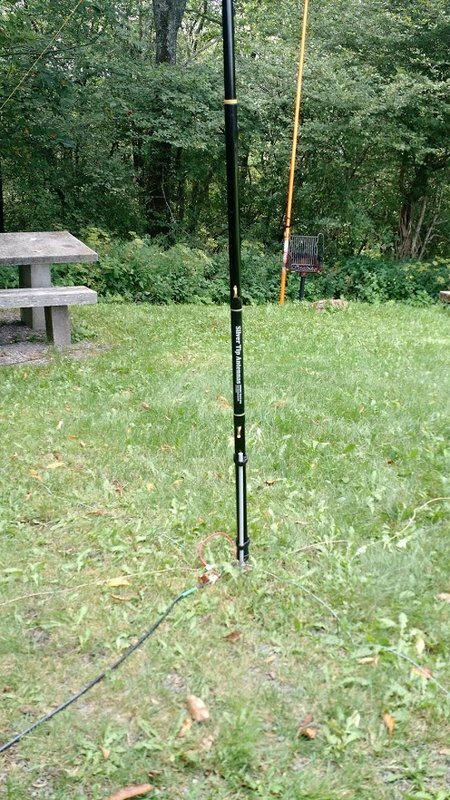 In the end, I was taken by the compact and easy-to-deploy design of LnR Precision’s EFT Trail-Friendly antenna, and purchased one on the spot. As many potential LD-11 owners might purchase the same antenna, I decided it might help to review it, too. 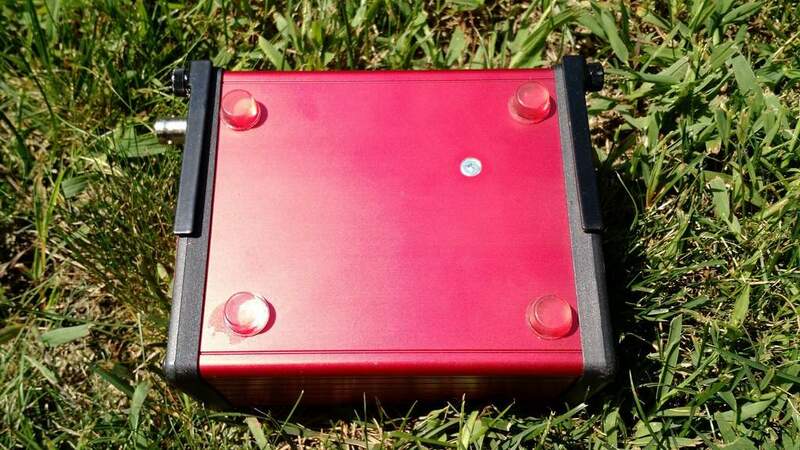 The EFT Trail-Friendly antenna is incredibly compact and quite easy to deploy. I bought a version of the EFT antenna that is resonant on 40, 20, and 10 meters. I like that band combo for NPOTA and SOTA activations, because I like operating on both the 40 and 20 meter bands. What’s especially brilliant about the EFT end-fed design is that you only need to suspend one side of the antenna: simply launch a line over a tree branch, and hoist the business end of the antenna up, and, snap–you’re ready to go. When wound up for transport, it’s also lightweight and takes up very little space in a kit bag. 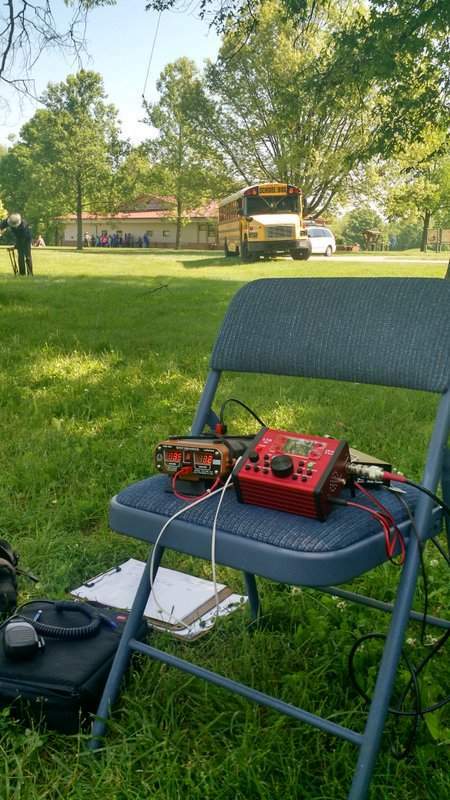 On the way home from the Hamvention, we activated the same four parks yet again. Eric and I tuned the EFT antenna before its initial use, and it was then ready to go. Eliminating the need for an external tuner and adding the simple EFT antenna to the mix meant that I could set up and take down my entire station in a matter of minutes. 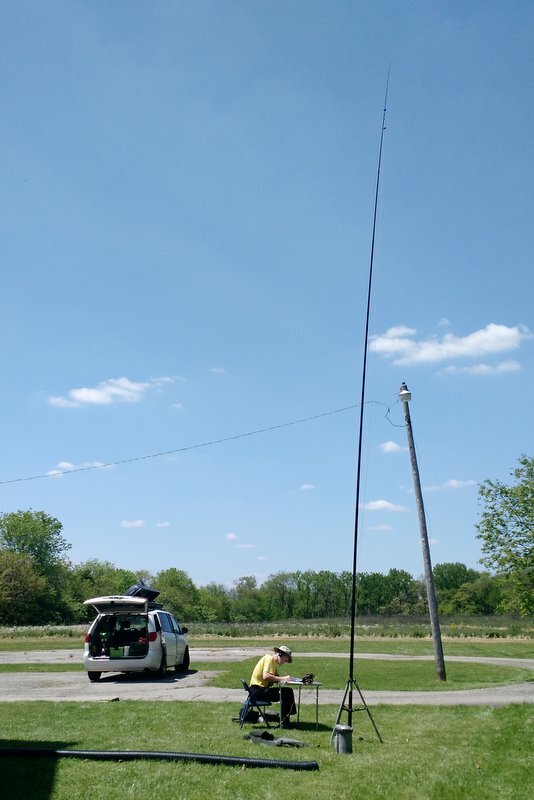 The only thing that took time at all was finding a tree branch to hoist the end of the antenna–usually not a problem, especially in our Eastern US parks. Moreover, the transceiver-plus-antenna team was quite effective: I easily logged all the contacts needed for all four sites in the one-hour time slots we allotted. In brief, I’ve been very pleased with the LD-11’s performance on the air. The LD-11 receiver is both sensitive and selective. Though I didn’t have the chance to test it in the RF-dense environment of Field Day, it never overloaded in the areas where I’ve operated. Through my headphones, the LD-11’s noise floor is impressively low and the receive audio is excellent. At first, I was a bit disappointed that the LD-11 doesn’t have an RF Gain control–something I frequently use to mitigate background noise–but fortunately the noise floor is low enough, and the DSP architecture seems adaptive enough, that I’ve never needed to reach for an RF gain control so far. Nonetheless, LnR: I do hope you’ll consider making RF Gain a future firmware update! The LD-11 is jam-packed with modes: USB, LSB, CW, CW-R, AM, and FM. The LD-11 can also handle a host of digital modes, and there’s the choice of two models to connect to your PC: one LD-11 model with the Prolific USB Adapter Chipset ($739), and another model with the more-universal FTDI chipset ($789). It’s outside the scope of this review to test the LD-11 on digital modes, but note that I plan to do so in the coming months. The modes I’ve tested thus far are SSB, CW, and AM. When I operated SSB, I found the default filters quite effective and the receive audio pleasant. On transmit, I received a number of positive reports on the LD-11’s audio. What’s more, through a menu option you can can adjust the transmit audio equalization (three defaults) to better match your voice. On CW, the LD-11 was equally as pleasant. On-board filtering is quite effective and audio well-balanced. On transmit, there is one negative worth noting for the CW operator: the LD-11 does not have full break-in QSK. While this isn’t a problem for me, because I find hearing signals between the dits and dahs I send rather distracting, I know many CW ops that don’t like using a delay on transmit, preferring instead a full break-in. LnR notes that the LD-11’s “maximum switching delay is 12mS and digital delay is 47mS.” If you set the LD-11 for the quickest response time, you can hear between most characters, but the relay clicking can be distracting. For all of my CW operations, I set the response time to 500ms. Wow…high praise, indeed. For those who don’t know him, Hansgen has high standards, and doesn’t hand out such compliments readily. Though the LD-11 isn’t advertised as having a general-coverage receiver, it will, in fact, tune the entire HF band. You initiate this broad-spectrum tuning by entering the LD-11’s administration mode. In the admin panel, you’ll find functions that allow you to set the band edges on each amateur radio band. LnR describes this process in the LD-11 product manual, but suggests you contact them for support the first time you do so. For a preliminary test of broadcast reception, I moved the lower band edge of the 30 meter ham radio band to 8.2 MHz. After saving the settings and re-starting the LD-11 in normal operation mode, I could then tune the entire 31-meter broadcast band on the LD-11. Hypothetically, you could either widen each amateur radio band to include adjacent broadcast bands, or you could simply set one of the ham bands to include the entire HF spectrum. To make it easier to navigate and tune through the bands, I prefer the former method. Since the LD-11 has a proper AM mode, broadcasts sound great–especially via headphones! Better yet, the AM filter width can be widened to an impressive 9.6 kHz–! When listening to a blowtorch signal, audio fidelity is most impressive. 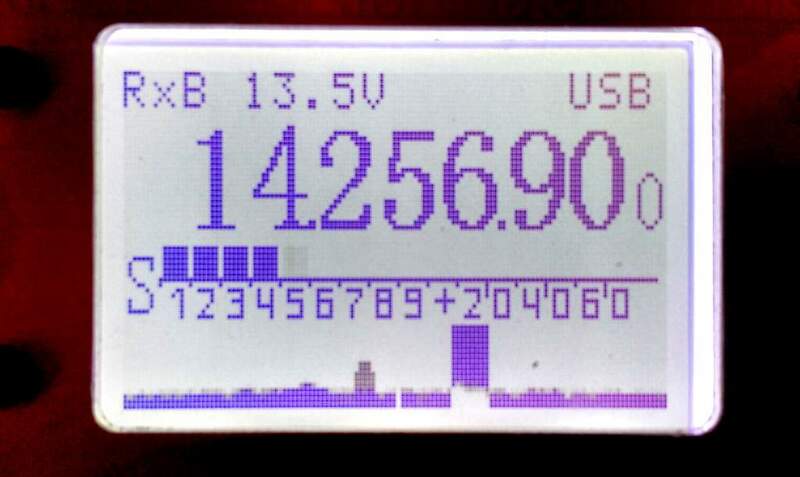 Click here to listen to a comparison of the LD-11 and Elecraft KX2 on the 31 meter band. The LD-11 has four filter slots: F1, F2, F3, and F4. The F1-F3 slots can be set to a fixed user-defined widths (common widths are default). The F4 position can be altered to any available filter width without having to enter the admin mode of the transceiver. Simply press the “F” (blue function button) and the FILTER button simultaneously, and use the encoder/tuning knob to specify the filter width in .1 kHz steps. Pressing the F and FILTER button, again simultaneously, will save your filter width for the F4 position. I’ve been using the F4 filter position for widths between approximately 8.2 and 9.6 kHz in AM. One final unique feature of the LD-11 is a built-in, simple panadapter. By pressing the F (function) and VFO buttons simultaneously, it will engage the panadapter which lines the bottom of the display. The panadapter display is found at the bottom of the LD-11’s backlit display. To be clear, the panadapter is very basic–it doesn’t include frequency markers, it’s monochrome, and it’s not very tall (height/depth helps to discern weak signals along the spectrum). In fact, when I first turned it on, I truly doubted its utility. Yet after having used the LD-11 for several months, I can say that one of the first steps I now take when putting the rig on the air is to engage the panadapter. Though it’s quite simple, I find it a useful tool for chasing signals on bands, whether SSB, CW, or even AM broadcasters. It’s also very responsive and fluid, which helps make up for the fact that it’s solid in color and rather flat. For example, the weekend before finishing this review, I activated PK01 (the Blue Ridge Parkway) for NPOTA. When I switched to 20 meters, the noise floor was so low that, when I first started calling CQ, I assumed that either the band was dead or the antenna wasn’t working. One look at the panadapter, however, showed me that there were some strong SSB signals on either side of my frequency. So I didn’t tune around, but simply continued to call CQ, which soon rewarded me with excellent catches (more on that below). All in all, the LD-11 is a superb little transceiver. It sits in a market with some heavy-hitters like the venerable Yaesu FT-817ND, the Elecraft KX3, and the new Elecraft KX2 (which I reviewed in the November 2016 issue of The Spectrum Monitor Magazine). While the LD-11 lacks some of the portability of those rigs (specifically, options for an internal battery and ATU–again, please take note, LnR), its performance-for-price-point is right, in my opinion. If you take the LD-11 to the field with a resonant antenna, as I have, all you need is a power source to be on the air in moments. If you pair the LD-11 with a simple ATU like the Emtech ZM-2 or the even smaller Elecraft T1, you’ll be able to tune wires to your heart’s content, and you won’t need extra power cables. Oh, yes…there’s one more thing I must mention about the LD-11: this rig has, for lack of a better word, a “fun” factor. It reminds me of one of my favorite QRP radios from days gone by, the Index Labs QRP Plus. The QRP Plus had many performance shortcomings and wasn’t nearly as full-featured, as lightweight, or as small as the LD-11, but it was a fun radio due to its dead-simple controls, nice display, prominent tuning knob, and good ergonomics generally, making it a breeze to operate. The LD-11 feels like what the QRP Plus should have been: a fun rig that delivers serious performance. The LD-11 is also easy to use, and that certainly contributes to its sense of fun. Operation has clearly been well thought through by the LnR developers. Only a few days before capping off this review, I took the LD-11 to the field for its 6th National Parks On The Air activation. With eight watts in SSB and a 20 meter vertical, I worked Rhode Island, Texas, Montana, Manitoba, California, and Slovenia from a picnic table on the Blue Ridge Parkway. And it was great fun, underscoring the reason I get such a kick out of HF and QRP in the first place. Of course, that’s the magic and the mystery of radio. But tools like the LD-11 make it all the more accessible. LnR Precision, I must say: pretty good trick. From your proverbial hat, you’ve produced the handiest little QRP rig I’ve seen in years. Click here to view the LD-11 on the LnR Precision website. 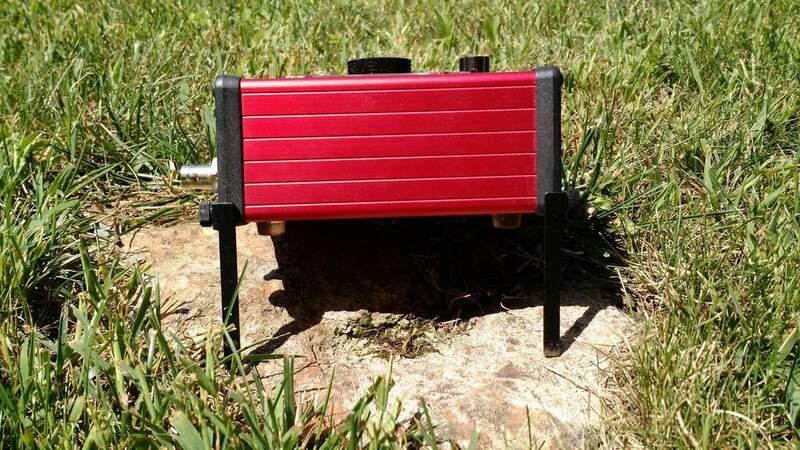 This entry was posted in AM, Ham Radio, Manufacturers, New Products, News, QRP, Radios, Reviews, Shortwave Radio, Shortwave Radio Reviews and tagged Amateur Radio, EFT Trail-Friendly Antenna, Ham Radio, LD-11, LD-11 Review, LNR Precision LD-11, LNR Precision LD-11 Review, National Parks On The Air, NPOTA, QRP, QRP Ranger on November 1, 2016 by Thomas. Last week, I attended the W4DXCC convention in Sevierville, Tennessee. The road trip afforded me several opportunities to make NPOTA activations through the Great Smoky Mountains National Park. I took my field kit which included the Elecraft KX2, QRP Ranger battery pack (not pictured), and EFT Trail-Friendly antenna. My first stop was the Ocunaluftee Visitor Center in Cherokee, NC, where I had planned the “two-fer” activation of the Great Smoky Mountains (NP26) and the Blue Ridge Parkway (PK01). First thing I did was ask the park ranger on duty how I could find the footpath to the point where the two parks overlap. Turns out, I had at least a one mile hike ahead of me. I love hiking, so that wasn’t a problem. The only problem was I hadn’t accounted for the hike in my plans, so I knew I would be a little late for the scheduled activation time. When I reached the Blue Ridge Parkway, I ventured down to the river where I found an excellent spot to set up my field kit. Thankfully, within thirty minutes, I had logged 15 contacts. I quickly packed up and attempted to catch back up with my schedule. I was grateful the Elk were elsewhere Thursday! Back at the ranger’s station, I learned that the Ocunaluftee Visitor Center is also another National Park entity: the Trail Of Tears (TR12). I had no time to deploy my station once more, but made a mental note to add it to activations on my return trip. Next, I hopped in my car and drove to the Newfound Gap parking area where the Appalachian Trail (TR01) crosses the Great Smoky Mountains Park (NP26). The area was packed with tourists, so I decided to hike up the Appalachian Trail (AT) to escape the bulk of the crowd. I hiked at least one mile up the narrow and steep AT before finding a suitable spot to set up my gear. It was a tight operating spot, but I managed to hang the antenna and position myself in a way that wouldn’t block foot traffic on the AT. I logged 18 stations in the span of about 45 minutes. I also took several breaks to answer questions about ham radio from hikers. I was particularly happy that one family took sincere interest in what I was doing and their young kids were fascinated that I was making contacts across the globe where there was no cell phone coverage nor Internet. I packed up at 20:30 UTC, hiked back to my car and managed to arrive at the conference center in Sevierville in time for dinner with my friends. My activations on the return trip, Sunday, included the same locations as Thursday. Instead of heading north on the Appalachian Trail, I decided to head south. I was running late to activate the site and knew if I headed north I’d have a long hike ahead of me. Once again, there were a lot of visitors at the site–many were there for a Sunday morning hike and were making their way (quite slowly) north. The southern route had no foot traffic at all, so I headed south. I found a suitable site to set up radio, but only because the trail was so quiet I could sit in the middle of it. The entire time I operated, I only encountered one hiker who was absolutely amazed I was making contacts across the continent when he hadn’t had cell phone reception in days. I logged 14 contacts in 45 minutes. Next, I headed back down the mountain to the Ocunaluftee Visitor Center to the same site where I set up before. Unlike my Thursday activation, contacts trickled in very slowly. It took over one hour to log 11 contacts. Propagation was very strange: the only stations I worked on the 20 meter band–a total of four–were located in Idaho and Slovenia. You can *almost* see my antenna hanging from its first location. Once, I even re-deployed my antenna, thinking that may help. I managed to raise the entire 35′ length into an ideal tree on the bank of the river. It was completely vertical with no slope. That did, perhaps, help snag my final two contacts. Despite the fact I was running late and I had struggled to make the minimum ten QSOs required for the NP26/PK01 activation, I decided to also attempt TR12 (Trail of Tears). I hiked back to the Ocunaluftee Visitor’s Center and found a quiet spot, once again, near the river. I was happy with my operating location and the fact the antenna deployed with no problem. Sadly, though, this activation was not meant to be. Even with multiple spots on the DX Cluster, I stopped operating after having only worked four stations in 45 minutes. If I hadn’t been on a schedule, perhaps I would have stayed another hour. I didn’t let this bother me, though. I knew the TR12 activation would be a gamble and I was happy to have provided four NPOTA chasers with another NPOTA catch for the day! All in all, I worked a total of 64 stations en route to and return from the W4DXCC conference. I call that a success, especially since I was able to enjoy some excellent hiking, scenery, weather and I even had a few opportunities to promote ham radio to the public. Of course, I feel like each time I do one of these activations, it also hones my emergency communication skills. Speaking of the W4DXCC, the conference was amazing as always and I’m happy to have been a part of it. 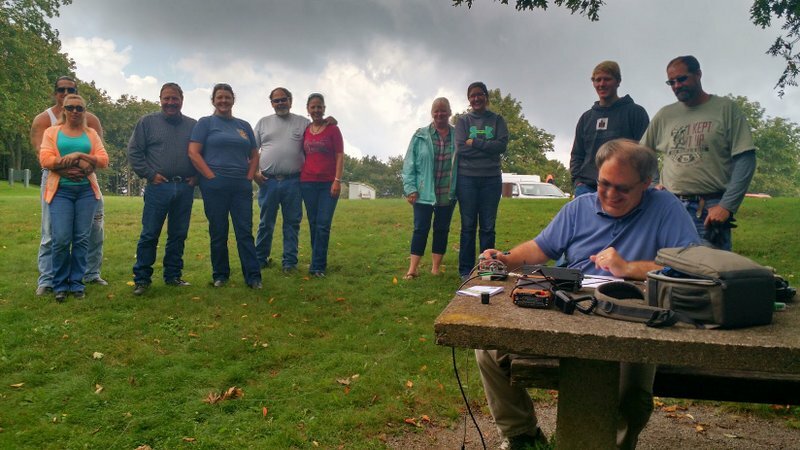 For the second year in a row, we hosted a “Ham Radio Bootcamp”–a day-long tutorial on all aspects of ham radio. Once again, it drew a large crowd. Vlado (N3CZ) demonstrating the IC-7300 functions and features at the Ham Radio Bootcamp. Each year, the convention operates as KB4C in a dedicated radio room. 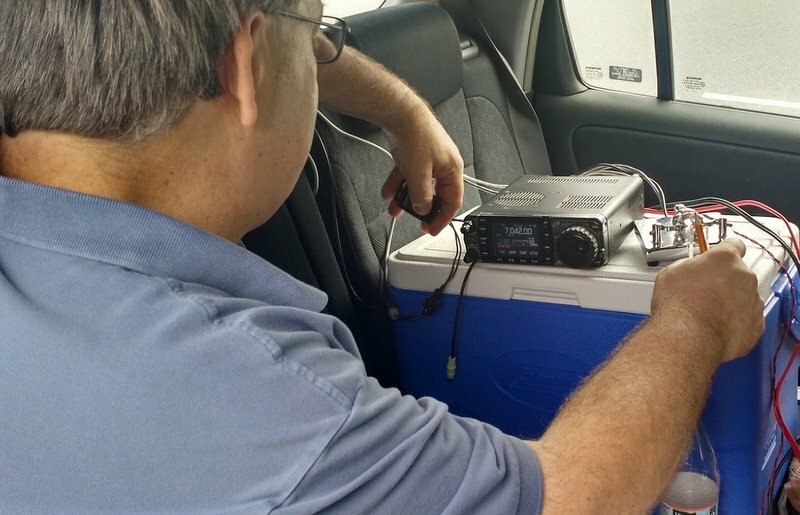 This year, we had two IC-7300 transceivers on the air simultaneously. We had at least three antennas available including this excellent hex beam. If you’re into DXing, contesting, or you’d simply like to make some new friends in the community, I would encourage you to put the W4DXCC conference in your calendar for 2017! This entry was posted in Ham Radio, News, Portable Radio, Travel and tagged EFT Trail-Friendly Antenna, Elecraft KX2, Ham Radio, N3CZ, National Parks On The Air, NP26, NPOTA, PL01, QRP, QRP Ranger, SEDCO, TR01, TR12, W4DXCC on September 29, 2016 by Thomas. A crowd gathers as Vlado (N3CZ) works station after station in CW! I’m not sure what I’m going to do after the National Parks On The Air event is over at the end of this year. I hope the ARRL organizes something equally as fun for 2017. Truth is, I love playing radio outdoors and I love National Parks. The two are a perfect combo. Vlado (N3CZ) on left, and me (K4SWL) on right. My buddy, Vlado (N3CZ), and I decided to do an NPOTA activation on Sunday. 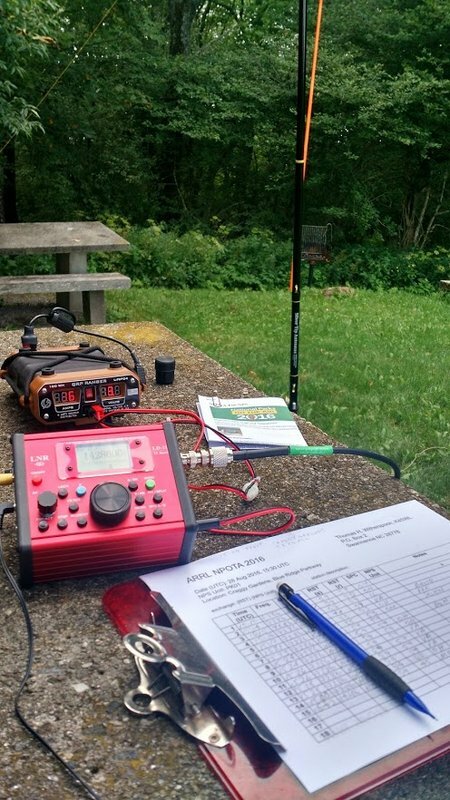 The weather was fantastic–a little foggy with mild temperatures and the HF bands were open! We arrived at our site–the Craggy Gardens Picnic Area (PK01)–at 14:30 UTC or so. a 31 foot fiberglass Jackite pole (the fluorescent orange on in the photos) which we used to suspend a homemade 40 meter doublet Vlado built the day before. Setup was quick. We were both especially pleased the 20 meter vertical. It was so easy to install, even considering it was the first time either of us had used it. 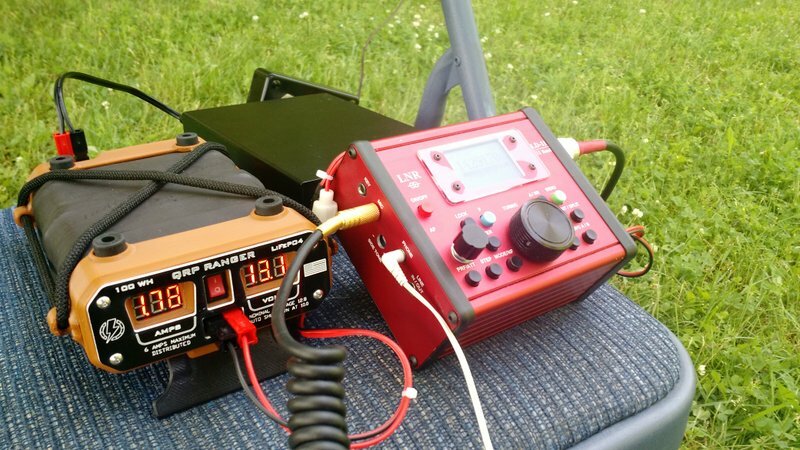 I powered the LD-11 and the KX3 with my QRP Ranger. The 20 meter vertical antenna (in foreground). 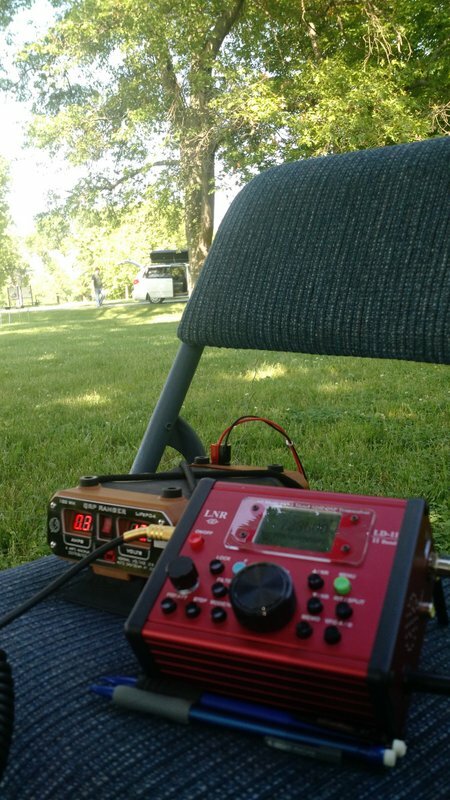 I operated SSB from a picnic table using the LnR Precision LD-11 transceiver, connected to the doublet on 40 meters, and the mono-band vertical on 20 meters. 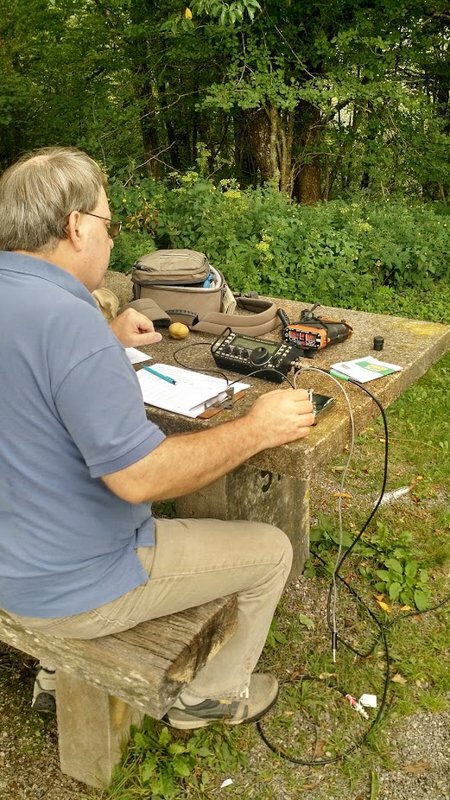 Vlado started by operating CW with his Icom IC-7000 which was installed in his car, but later moved to the picnic table and logged a number of contacts with the Elecraft KX3. We easily logged the number of stations needed to activate the site. The 40 meter band was hopping and a good path was open into Ohio, Virginia and other surrounding states. The 20 meter band was serving up some excellent QRP DX. Vlado operating CW on the 40 meter band. When I moved to the 20 meter band, the noise floor was so low on the LD-11, I thought perhaps the band was dead. Not so! 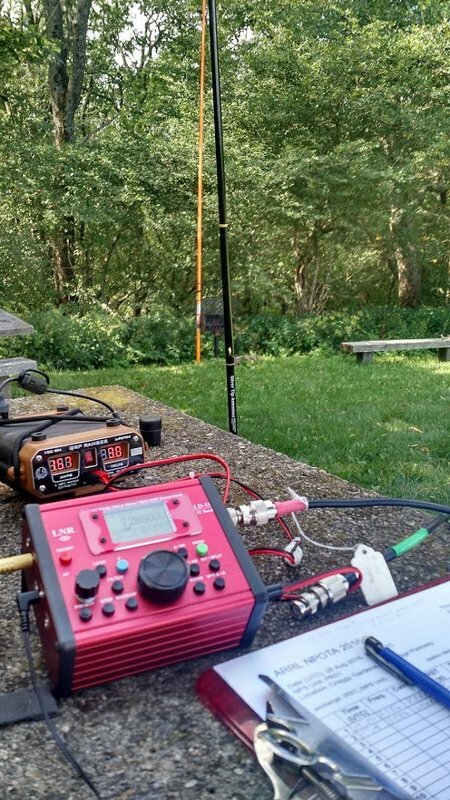 It’s hard to believe that with a mere eight watts in SSB I worked Rhode Island, Texas, Montana, Manitoba, Washington, California and Slovenia from a picnic table on the Blue Ridge Parkway. Vlado and I are planning on several more activations together this year. Our next one will most likely be at the Carl Sandburg Home-. I can’t wait! Any other post readers participating as an activator or chaser in the National Parks on the Air event? 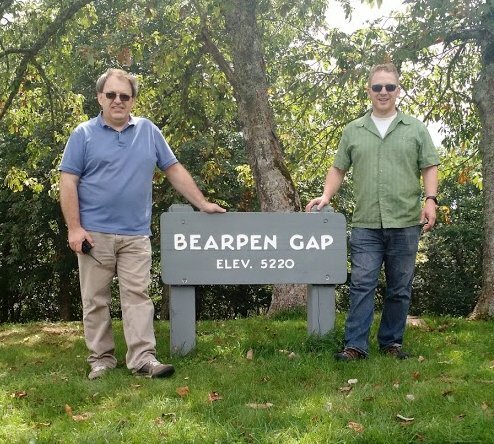 This entry was posted in Ham Radio, News, Portable Radio, Radios, Shortwave Radio and tagged Blue Ridge Parkway, Elecraft KX3, IC-7000, Icom, Icom IC-7000, K4SWL, KX3, LD-11, LNR Precision LD-11, N3CZ, National Parks On The Air, NPOTA, PK01, QRP, QRP Ranger, Vlado on September 3, 2016 by Thomas. After two months in Canada and one month spent catching up on work, I’m pleased to make some time this weekend to activate PK01 (the Blue Ridge Parkway) for the ARRL National Parks On The Air (NPOTA). I’ll be joined by my good friend, Vlado (N3CZ) on August 28–we plan to set up at the Folk Art Center on the parkway around 11:00 EDT and be on the air by 11:30 EDT (15:30 UTC). I plan to use the LNR Precision LD-11, QRP Ranger and EFT Trail Friendly Antenna combo. Vlado will either use his Icom IC-7000, Kenwood TS-480 or my Elecraft KX1. Life has been so hectic after having been on the road for two months–I’m pleased to finally have a moment to play radio in the field again! 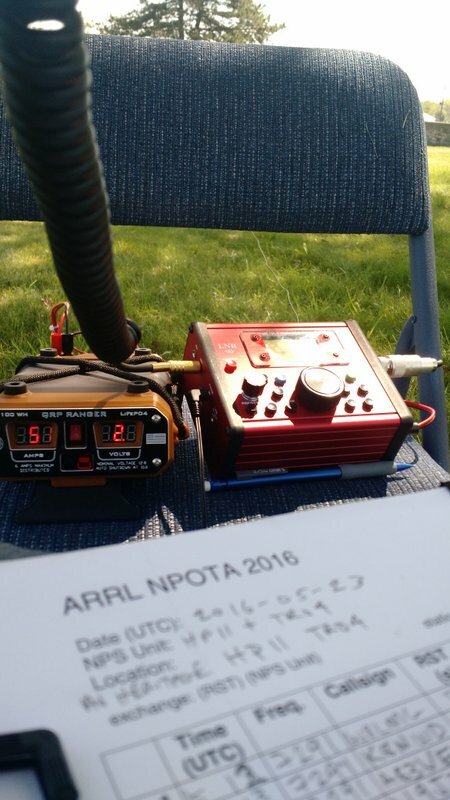 This entry was posted in Ham Radio, News and tagged EFT Trail-Friendly Antenna, K4SWL, LNR Precision LD-11, N3CZ, National Parks On The Air, NPOTA, PK01, QRP Ranger, Vlado on August 26, 2016 by Thomas. I returned home last night from my week-log Dayton Hamvention trip around 8:30 PM. The Hamvention actually ended at 1:00 PM on Sunday, May 22, but my buddy Eric McFadden (WD8RIF), his son Miles (KD8KNC) and I stayed Sunday night in Dayton, and Monday night at Eric’s home in Athens, Ohio. After packing up our Hamvention booth (for Ears To Our World) on Sunday, we made our way to the nearby National Museum of the USAF–the largest aviation museum in the world. We visit the museum every year–and every year I discover something new. This BC-348 can be found in one of the museum’s B-29 displays. 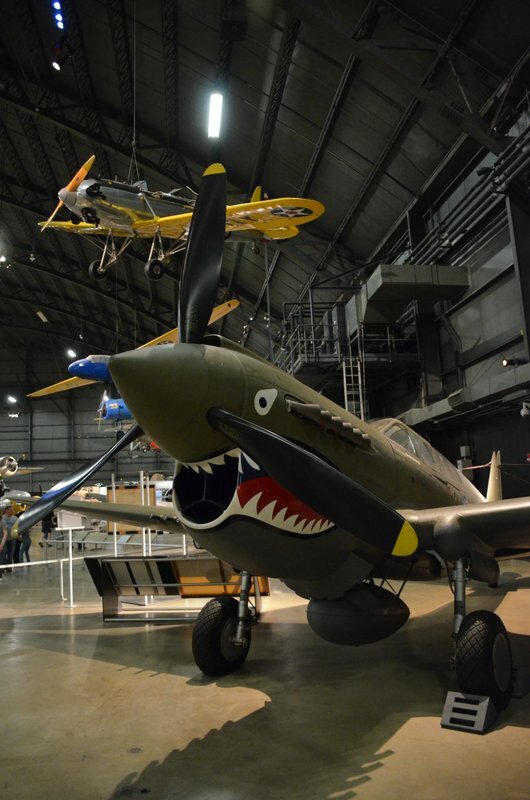 In June, the Air Force museum is actually opening a fourth building which will house an additional 70 aircraft in four new galleries. 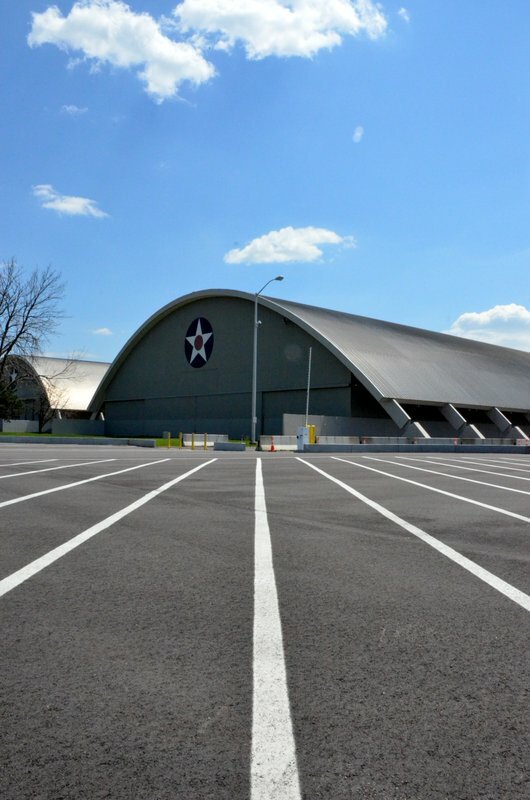 If you’re an aviation buff–trust me–the National Museum of the USAF is worth a pilgrimage to Dayton, Ohio. Monday morning, Eric, Miles and I packed up, ran a few errands on Wright Patterson Air Force Base, then made our way to our first National Parks On The Air activation: the Dayton Aviation Heritage National Historical Park (HP11) and North Country National Scenic Trail (TR04) “two-fer” at Huffman Prairie Flying Field Interpretive Center in Dayton, Ohio. Eric worked CW on 20 meters and I worked SSB on 40 meters using the LNR Precision LD-11 transceiver (which I’m currently reviewing) and my recently-purchased Hardened Power Systems QRP Ranger. 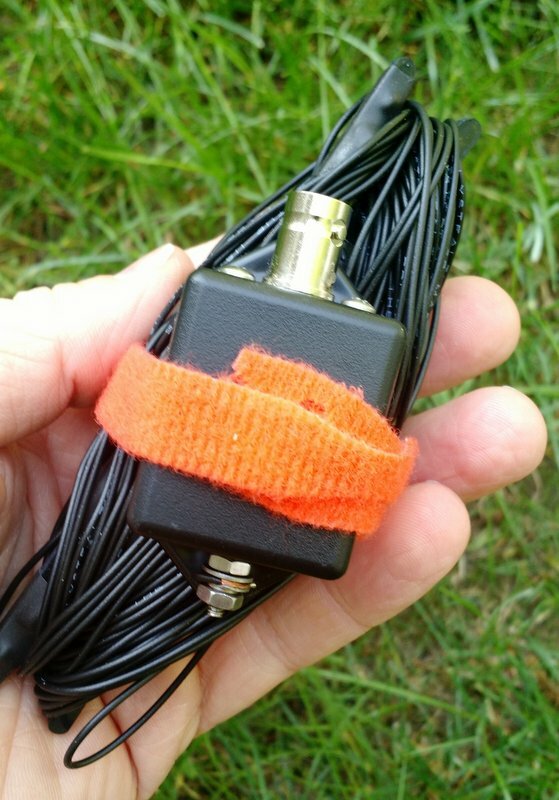 The EFT Trail Friendly Antenna made set-up a breeze: simply throw a line into a tree, hang the end of the antenna, then hook up the other end to the feedline/transceiver. No antenna tuner is needed for 40, 20 or 10 meters once the antenna is tuned for resonance. It packs up into a small bundle that easily fits in my radio go-kit (see photo above). The LD-11/QRP Ranger/EFT antenna combo worked amazingly well and made for very quick deployment. I can easily fit the LD-11 transceiver and QRP Ranger on a foldable metal chair (my make-shift field table!). 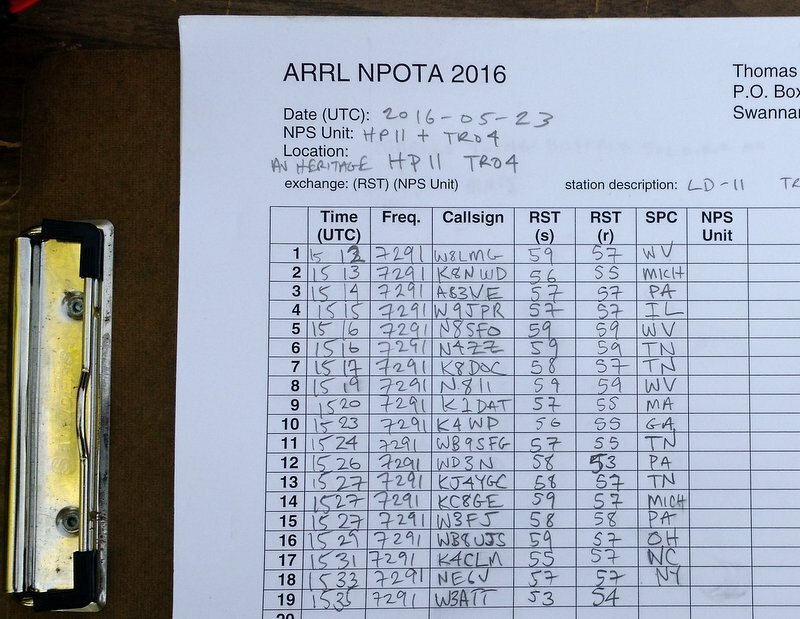 My buddy Eric, I should mention, is typically on the leaderboard for NPOTA as he’s an avid QRP field operator. Eric (WD8RIF) operating NPOTA with his field-portable vertical HF antenna. You can follow Eric’s activations on QRZ.com or his website. Eric’s field-portable HF vertical packs up into this small canvas bag. 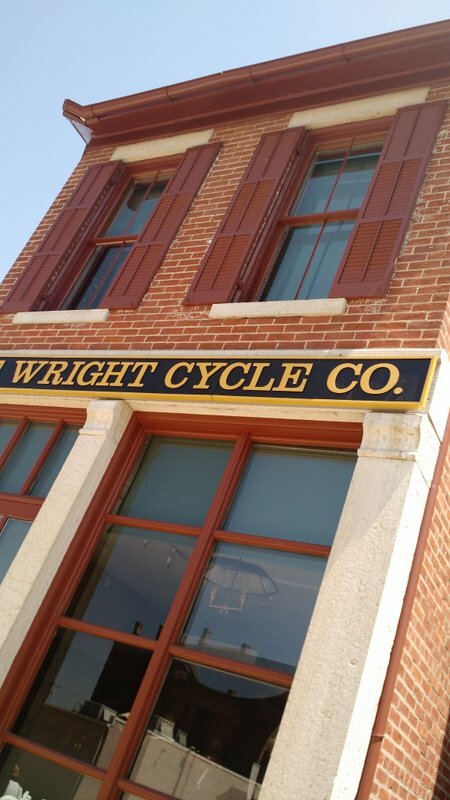 We had a tight NPOTA activation schedule to meet Monday, but after packing up from our first sites, we took 30 minutes to stop by the Wright-Dunbar Interpretive Center and The Wright Cycle Co. museum in downtown Dayton. Well worth the short visit! Next year, I’ll plan to revisit both museums when I have more time. Next, we made our way to the second scheduled NPOTA activation site: the Charles Young Buffalo Soldiers National Monument (MN18). Despite not having my antenna very far off the ground (my antenna line fell down one branch in the process of hanging) I still managed to work a pile-up of stations from Georgia, North Carolina, Ohio, Illinois, Connecticut, Michigan and Indiana. After Eric and I racked up a number of QSOs, we packed up our site in haste and made our way to the final activation of the day: the Hopewell Culture National Historical Park (HP15). We arrived as the Park Ranger was getting in his car to leave for the day! At Hopewell, I managed to deploy the EFT antenna much higher off the ground. I worked a small pile up of stations from all over the region which, to my surprise, included two radio friends (Ed and Eileen) in Franklin, NC. Eric also worked blogging buddy John Harper, AE5X on 20 meters CW (got your message, John!). All in all, it was a fantastic day to be outdoors and on the air. Of course, a side benefit of doing National Parks On The Air activations is that you get to check out all of these amazing park sites. 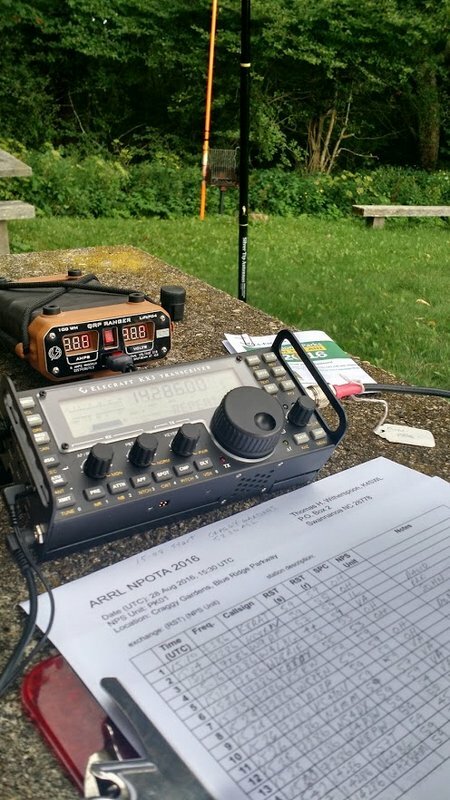 Without a doubt, this was one fun-filled and radio-centric Hamvention week! It couldn’t have been better. Part of my log sheet for NPOTA HP11 and TRO4 “Two-Fer” activations. Not bad for such a tight schedule! Many thanks to my friends Eric (WD8RIF), Miles (KD8KNC), Mike (K8RAT) and Christine (KM4PDS) for volunteering to manage our Hamvention booth for Ears To Our World. It was a record year for collecting donations. Many thanks to all of you for the support! I’d also like to thank the SWLing Post readers who stopped by to visit our new location in the Silver Arena–it was great seeing everyone! 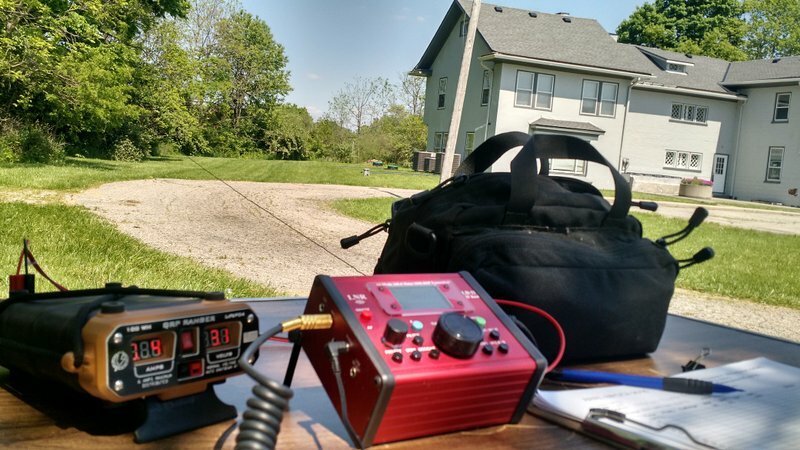 This entry was posted in Antennas, Articles, Ham Radio, New Products, News, Portable Radio, QRP, Radios, Shortwave Radio and tagged 2016 Dayton Hamvention, Charles Young Buffalo Soldiers National Monument, Dayton Aviation Heritage National Historical Park, Dayton Hamvention, EFT Trail-Friendly Antenna, hamvention, Hardened Power Systems, Hopewell Culture National Historical Park, K8RAT, KD8KNC, KM4PDS, LD-11, LNR Precision LD-11, National Museum of the USAF, National Parks On The Air, North Country National Scenic Trail, NPOTA, QRP, QRP Ranger, WD8RIF on May 25, 2016 by Thomas.